Carbohydrates - it doesn't matter whether these are sugar, jam, bread, pasta, breakfast cereals or fruit - are all exactly the same as far as your body is concerned: they are all converted to the blood sugar, glucose. Insulin takes excess glucose out of the bloodstream. It is converted first to a form of starch called glycogen which is stored in the liver and muscle cells. But as the body can store only a limited amount of glycogen in this way, all the other excess glucose is stored as body fat. This is the process of putting on weight. As you can see, carbs are digested very quickly and raise blood glucose rapidly. This means that within a very short time after a carb-rich 'healthy' meal the level of glucose in your bloodstream will rise rapidly. 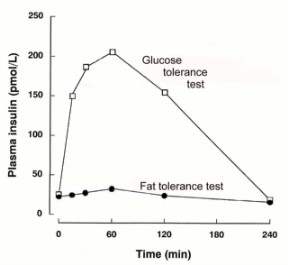 Figure 1a shows that a high-carb meal increases blood glucose dramatically whereas a high-fat meal has practically no effect at all. High blood glucose levels are harmful to the body and, as levels of glucose rise rapidly in the bloodstream, your pancreas produces a large amount of insulin to take the excess glucose out. This can be seen clearly in Figure 1b. A healthy insulin level is one below 40 pmol/L. With a high-fat meal, it is. There is a further aspect to be considered: There is an inevitable time delay between cause and effect. If you look at the two graphs above, you will see that when your blood glucose level is back down to a normal level of 6.0 mmols/L (108 mg/dL) after about 90 minutes, the insulin level in your bloodstream is still high and packing glucose away as fat in your fat cells. This drives glucose in your blood abnormally low (it's called reactive hypoglycaemia ) and you soon feel hungry again. So you have a snack, usually of more carbohydrates and start the whole process over again. You're getting fatter - but feeling hungry at the same time. During this, your blood sugar levels are fluctuating wildly - you are 'yo-yo dieting' by the hour. The answer is to eat less carbohydrate so that the blood sugar level does not fluctuate so violently, and eat more fat. Because it takes a long time to digest, fat not only prevents those violent fluctuations in blood sugar levels, it gives a feeling of satiety, which stops that feeling of hunger. Not surprisingly, a 'healthy' carbohydrate-based diet, whether or not it is low-GI, gives by far the worst control of blood glucose and insulin levels. You will note that insulin levels after a carb-rich meal don't return to normal for some 4 hours. Note again that fats have little or no effect on blood insulin levels. The next problem is that insulin resistance caused by the continual high levels of insulin in your bloodstream impairs the insulin's ability to satisfy a satiety centre in your brain. This contributes to overeating, obesity, and diabetes. This is the first crucial problem with the 'healthy eating' dogma. Eating the 'healthy' way, you can eat far more calories than your body needs as energy for the day, yet still feel hungry - and eat more. You enter a vicious cycle of continuous weight gain combined with hunger. Under such circumstances it is almost impossible not to overeat. Obesity is almost inevitable. 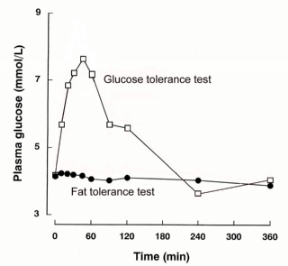 Note that, as the two graphs show, fat raises neither glucose levels nor insulin levels. This means that, despite what you have been told, dietary fat does not make body fat. 1. Robertson MD, Henderson RA, Vist GE, Rumsey RDE. Extended effects of evening meal carbohydrate-to-fat ratio on fasting and postprandial substrate metabolism. Am J Clin Nutr 2002; 75: 505-10.